Sometimes all it takes is a tiny, little disagreement between us to totally ruin the night. Apparently, successful relationships require that you embrace the fact that it's not all about YOU. You can't be self-centered, self-absorbed, always pursuing what YOU think is fun, without consideration of the other partner's wishes. You may differ in your tastes and temperaments. What may upset them may not upset you, but if you don't take THEM into consideration when making plans, picking restaurants, etc... watch out. Depending on the time of month, they just might spend every remaining moment of the evening making sure you not only sympathize, but empathize, with every ounce of their discomfort. If what I'm describing sounds like your romantic relationship, I really don't have anything to offer but the name and number of a good counselor. But if it sounds just like your relationship with your digestive system from time to time, I've got just the solution. If you've felt any of the following from time to time, this oil is for you. AND - it's one of the 11 oils that comes in the must-have, do-all, workhorse oils combo deal known as the Premium Starter Kit. Optimize your digestion with this potent blend of oils including ginger, peppermint, anise, fennel. These have been used for millennia in ancient cultures for their powerful ability to help stimulate your gut to produce the right gastric juices, aiding the proper break down of foods...all so that your body can better utilize their nutrients instead of dumping them straight in the waste bin. Not only that - but these herbs have been used traditionally to minimize the effects of indigestion such as the bloaty, uncomfortable, stuffed, or slightly nauseous feelings we get after eating something that our stomach doesn't fully agree with. In other words, not only do these herbs taken with a meal help your gut digest well so that those undesirable effects aren't produced in the first place as by-products, BUT - it also works great even if you don't take it until hours after the fact, at that time when you're experiencing those undesirable effects. Ever noticed that Chai tea is served after the meal at Indian restaurants? That's because the potent effects of ginger are helpful as post-meal digestive aids. In Ayurvedic and Chinese medicine, ginger and ginger tea are used for a whole host of stomach-helping purposes. Even in Western medicine ginger is known for its anti-nausea properties for those with motion sickness, morning sickness or sluggish digestion. Ever noticed at Indian restaurants near the entrance there is sometimes a little bowl of whole spices? That's mukhwas - and you're supposed to take a spoonful and chew them on your way out - as odd as that sounds to us Westerners. It's a blend of fennel and anise seeds that are very effective in aiding digestion and prevention of... well, air in the gut. Ever noticed at American restaurants near the entrance they have a little container of individually wrapped red and white discs that are pure sugar plus five food colorings, and bit of artificial peppermint flavor? Well - that's the Americans' attempt at aiding digestion, bless their hearts! The point is, many cultures end their meals with some form of these potent plants, and for good reason. Western medicine is also interested in their effects on digestion. Dr. Axe has lots to say about fennel's properties! 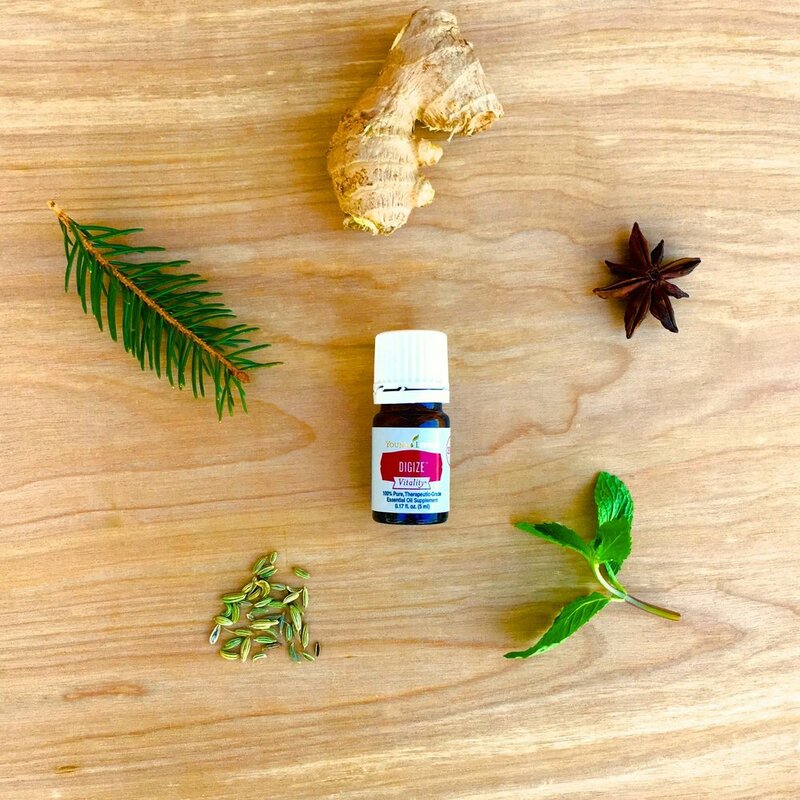 In addition to these wonderful, well-known herbs, DiGize also contains the lesser-known digestion-aiding oils of tarragon, juniper, patchouli, and lemongrass. If you're dealing with post-meal problems, a drop of DiGize rubbed straight on your stomach can do wonders. I know people who rub it on their abdomen in a roller-ball bottle nightly with black pepper oil for maintaining a happy stomach. I know people who massage it into their abdomen clockwise to get things moving, or massage it counter-clockwise to slow things down. I also know people who put a drop in their navel when feeling icky while traveling. I've rubbed it there too... once. Last summer I had a deadline I had to meet while riding in the car on a 4-hour road trip. I was resigned to not meet the deadline, knowing that I usually have a 10 minute MAX threshold for reading, writing, or typing in the car (especially on that hilly highway) before I feel nauseated. But then - I remembered my DiGize. I had just received the Starter Kit, so I'd taken the whole thing on vacation with me and had my DiGize right there! I put a drop right on my navel, and I'm proud to say I lasted 2 full hours doing all of the above and finishing my project completely! (Disclaimer:) However... the smell totally filled the car. And though I have friends who can somewhat tolerate the smell of DiGize, I do NOT enjoy it whatsoever. It's the only aroma in the everyday-oils in the starter kit that I do not thoroughly delight in. Thus - since then, for every occasional digestive dis-agreement I've had, I've dropped 1-3 drops in an empty capsule from a natural foods store, and added a few drops of olive oil to dilute it, and swallowed the pill. That way, I don't have to smell it but can still benefit from its amazing properties! So...forgive it for its potent scent. The tarragon, fennel, and patchouli are the stinky (IMHO) oils in the blend, but are doing wonders for your gut. Google these potent digestion-aiding herbs. So - go ahead and get some DiGize, and drink (or rub) to a healthy gut! As a side note, in addition to this great oil blend, I do want mention the importance of actual food enzymes and their role in digestion. Many people experience mild digestive discomfort and are trying to completely eliminate common problem foods from their diets like dairy, legumes, cruciferous vegetables, and the like. Since some of these are very nutritious, valuable foods, I HIGHLY encourage you to research digestive enzymes before eliminating healthy stuff (go ahead and ditch your daily dose of gelato, though). There are different enzymes for helping your gut break down meat and starches, and our body generally makes fewer of them as we age. comes in enteric-coated capsules, so that they make it all the way to your intestines where they can do their magic. Since the whole of the body's health starts with a healthy gut, supplementing with HIGH QUALITY digestive enzymes and probiotics is really important if we want to keep our body's powerhouse serving the rest of our body well, both now and in the years to come!